This brass suede brush and nylon suede brush set has all you need for clean suede it does not matter where you need to use it. Nylon bristle suede brush. Plain wood block. 2.9x 1.1X 1. All purpose nylon bristle brush. Easy to store, Easy to carry. 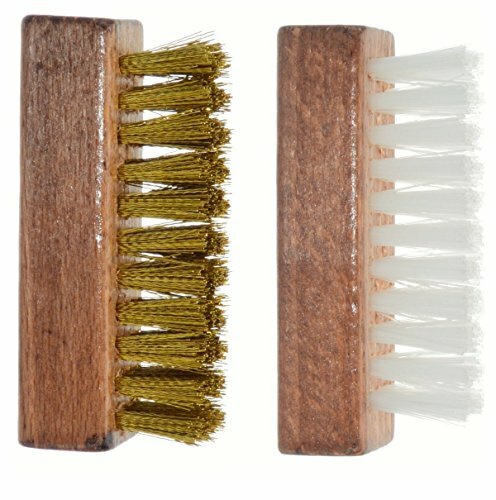 This suede brass brush has a wood block that measures 2.9" x 1" x 0.6. The brass bristles measure 0.5 inch in length. easy to store and carry. Brass suede brush with traditional block. High quality brass and nylon bristles. If you have any questions about this product by Ralyn, contact us by completing and submitting the form below. If you are looking for a specif part number, please include it with your message.